We are near the end of new releases week, but we're not quite done, so today's ink is Montblanc Unicef Blue. Anderson Pens was very kind and sent a sample over for review. Unicef is a bright blue with some shading, a great color for summer. There is a little bit of pink sheen on the edges of the swab. One thing I do want to mention about this ink is the cost. A 50ml bottle of ink is $43. It does come in a beautiful bottle, but it is on the expensive side. Bleeding: Low-there was some bleeding in the flex nib on Tomoe River. On 20 pound copy paper there was just a little bit of feathering but other than that the ink behaved well. Ink swabs for comparison, left to right (top to bottom for mobile RSS): Lamy Pacific Blue, Montblanc Unicef, and Robert Oster Blue Lagoon. Click here to see the Montblanc inks together. Pacific Blue and Blue Lagoon are both just a little bit darker than Unicef. Robert Oster Bondi Blue, Diamine Aqua Blue, and Robert Oster Fire and Ice. 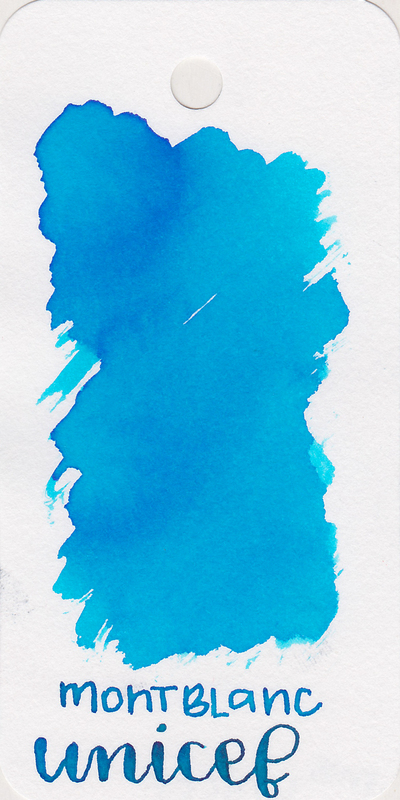 Click here to see the blue inks together. Aqua Blue is a little bit lighter than Unicef. I used a medium Pelikan M800 Renaissance Brown on Tomoe River paper. The ink had an average flow. Overall, Unicef is a nice color. While Pacific Blue is a little bit darker than Unicef, I think it is close enough that I can't justify the price of a bottle of Unicef. Give it a try, you might love it. Disclaimer: This sample of ink was sent to me by Anderson Pens, for the purpose of this review. All photos and opinions are my own. There are no affiliate links on this page.